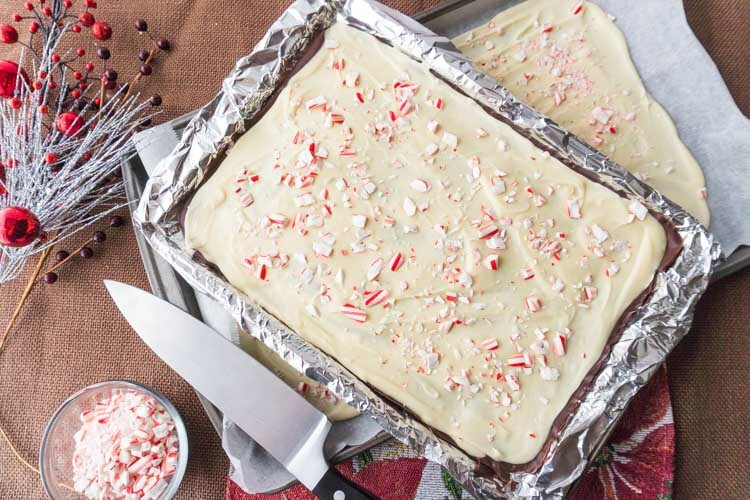 For the longest time, I always thought peppermint bark was hard to make. It seemed like it was out of my reach, so to speak, and I’d just have to enjoy it when someone else made it. Boy was I wrong. 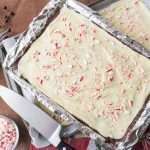 This is not only the best peppermint bark, but also one of the easiest desserts I’ve ever made! I had so much fun making it I decided to try two different versions. It takes no time at all to make and then you just have to let it cool, which is hard to do, but to tide yourself over you can lick the bowl haha! 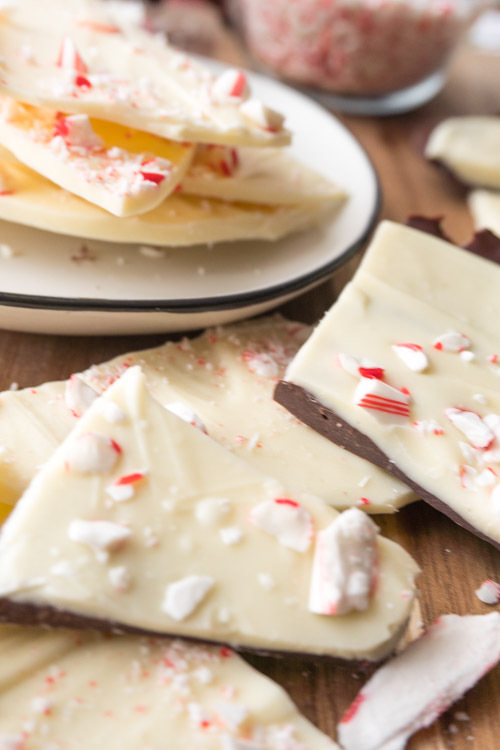 I thought I would try making both white chocolate peppermint bark and white chocolate and semi-sweet peppermint bark. Both turned out amazing and I honestly couldn’t pick which was my favorite. They were both sooooo good. To make the bark, all you do is melt the chocolate and pour into a lined baking sheet. Then add crushed candy canes and refrigerate until hardened. 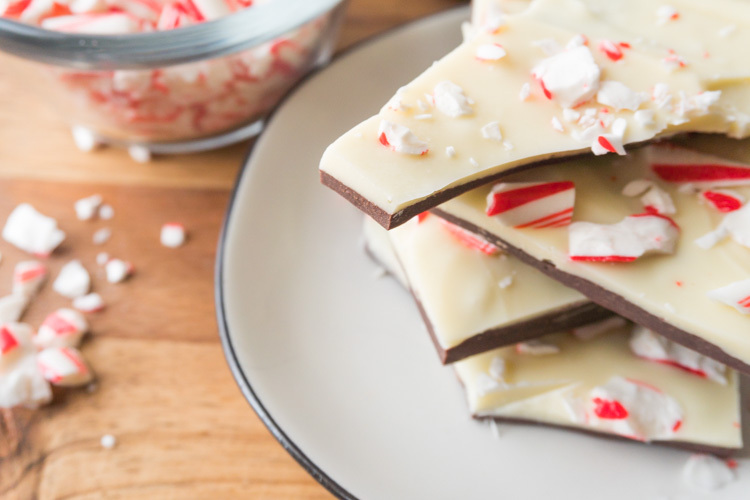 If you want to, you can add peppermint extract to the melted chocolate before pouring onto the baking sheet. It’s seriously that easy. The trickiest part to this is if you make the semi-sweet chocolate version. You melt the semi-sweet chocolate and pour it into the baking sheet. Then melt the white chocolate and slowly pour it onto the semi-sweet chocolate and carefully spread it out. That way you will get two distinct layers. But hey, even if they mix it will still be delicious and would probably look really pretty all swirled together….. hmmm maybe I should try that. Anyways, this recipe makes a ton, so be prepared to take it to a party or share it with your neighbors! I had to have my husband take the majority of it to work so I wouldn’t eat it all! Check out these other amazing desserts: eggnog cupcakes, oreo cheesecake truffle balls and these snickerdoodle cheesecake bars! 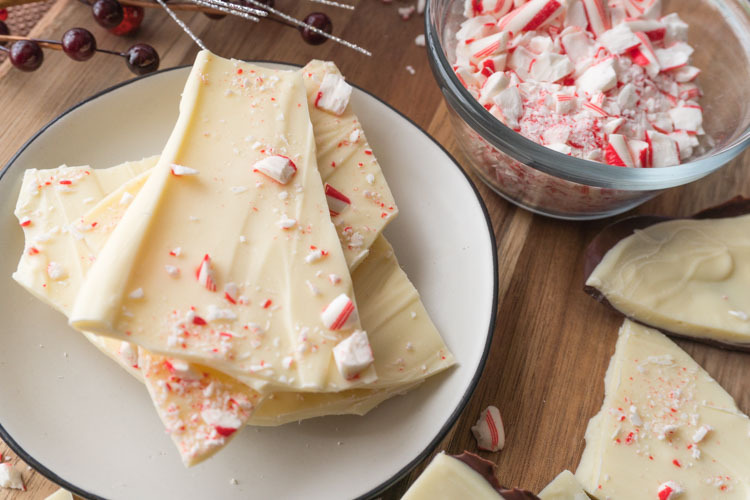 This simple white chocolate peppermint bark will be the hit of any holiday gathering! With the smooth white chocolate and the wonderful taste of peppermint how can you go wrong! Using a microwave safe dish, melt semi-sweet chocolate. * Turn you microwave to 50% power and microwave chocolate in 30 second increments, stirring after each increment. When chocolate is fully melted, add in peppermint extract if using and stir until combined. Pour melted chocolate onto lined baking sheet. Using a rubber spatula, smooth chocolate out. Melt white chocolate in the same way as the semi- sweet chocolate. * Gently pour over semi-sweet chocolate. Carefully, spread white chocolate into an even layer, making sure it doesn’t mix with the semi-sweet chocolate. Sprinkle with crushed peppermint. Refrigerate for at least 30 minutes or until chocolate is firm. Using a sharp knife cut/break into bite size pieces. * You don’t need to use semi- sweet chocolate! 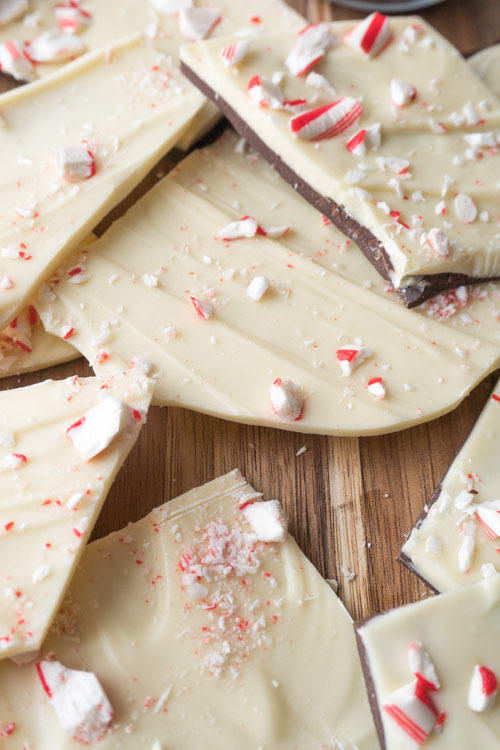 You can just melt the white chocolate, add in the peppermint extract (if using) and pour onto a baking sheet, and sprinkle with the peppermint candies. Using the semi-sweet chocolate will make the bark a little thicker and obviously uses semi-sweet chocolate which pairs nicely with the white. Add as much or as little peppermint extract as you want! I would taste as you add so you know when to stop.